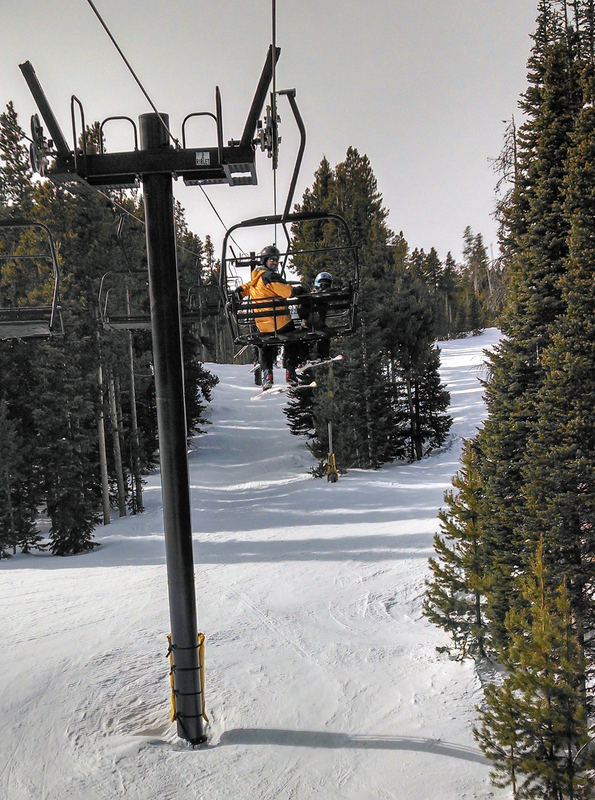 Riding the lifts with my boy. Back in my halcyon days of youth, a four-day weekend meant four days dawn-to-dusk (or more) of rigorous outdoor fun. Work and family commitments (not to mention old age and treachery) have taken their toll, but I can still manage a good showing every now and then. In this case, it was a brace of ski trips: an in-bound trip with my family on Sunday, then an out-of-bounds jaunt on Monday. It’s all good. On Sunday, we ventured to the local ski hill with some friends for some father/son skiing and lodge-hanging-outing. In total, Joe and I managed 12 runs together (9 if you don’t count magic carpet riding which would be understandable), many of them with Dave/Ben also leashed on various green runs. Joe and I tandemmed through Fun Gully (read “tree skiing for people who ski green runs”) which was, as advertised, super fun. Dave and I snuck out for a glorious hour on the backside skiing a pair of blacks and a nice long blue run on really nice snow, before coming home and letting the ladies have a turn. All in all, good times and a lot smoother than our last time up there a month ago. Monday’s outing (taken under the mistaken impression that President’s Day is an Official Holiday, oops!) was much wilder. The plan was that Brian and I would meet at Bear Lake and ski/snowboard either Flattop (if the weather was good) or up to Emerald Lake if otherwise. Brian hasn’t been in the mountains much lately and, with a good day of on-piste adventure recently under my belt, I was feeling mellow. The weather, as it turns out, had other plans for us. The wind had been howling at 50+ mph all night. Coupled with blowing snow and a little bit of melt/freeze going on, the Peak to Peak Highway was about ten miles of the scariest driving I have ever encountered: glare ice and a strong cross wind, car moving straight ahead down the road but pointed a couple degrees to the left, no , No way we were going up Flattop today and even driving to Bear Lake seemed imprudent. The old Hidden Valley resort map. Most of these trails are still visible if you look closely. We managed to put together an alternate plan, however, and headed for Hidden Valley, the “snow play” area of RMNP. Now, as a backcountry skier, I consider most of the Park to be fair game for snow play, but this is the officially-sanctioned sledding area at the site of the old Hidden Valley Ski Area which operated from the mid-1950s until the early 1990s. The lifts and infrastructure are gone now, but the cleared lift lines and many of the ski runs are still there, so it’s great for skinning up and getting some resort-quality ski runs without the hoards of resort guests. The weather down here in the shelter of Trail Ridge and the trees was actually pretty nice — warm, sunny, lots of snow, and only a modest breeze. The old T-bar line is quite obvious as was the skin track up the slope to the left (what turns out to be the remains of a blue run named Spruce), so we started the steep, 700’ ascent. From the top, it leveled out but continued almost all the way to Trail Ridge Road. We passed an obvious old ski run on the right (Aspen), but opted to skin up the road for a mile or so to access the big, central run down the creek drainage. Headed back up for more! 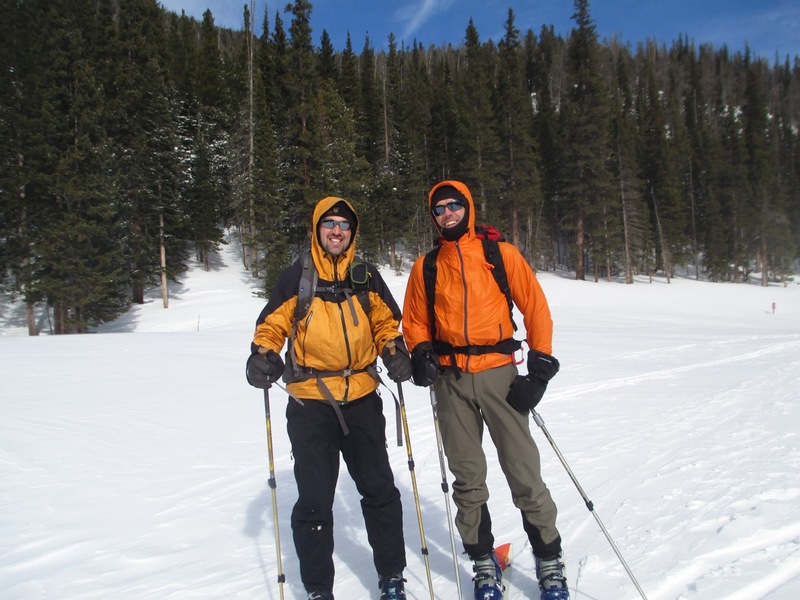 After a leisurely lunch at 10,600’ and a chat with one of the three rangers we saw out on skis, we geared up and spent ten minutes on some of the nicest skiing I have ever done in my life. 1100’ of almost completely untracked powder down through open glades and occasional trees. Back in the day, Columbine was rated as an intermediate run with certain harder options if you strayed down into the creek bed itself, and this seemed about right. That was so much fun, we had to go back for more. Back up Spruce and the T-bar line and this time we took the first obvious right down Aspen. Another blue run, though shorter with more young trees this time. Nor were we the first tracks as at least half a dozen other skiers had clearly been there before us. Still, it was another splendid batch of earned turns back to the busy Snow Play Area. So much for mostly cloudy and snowing. Making it look semi-decent on Aspen. Now that’s what I’m talking about! Combined with last weekend’s epic hut trip, that makes for two consecutive days in ski boots, two weekends running. I call that realizing the Colorado outdoor lifestyle to the fullest even if I can’t muster for multiple dawn-to-dusk days in the outdoors anymore. 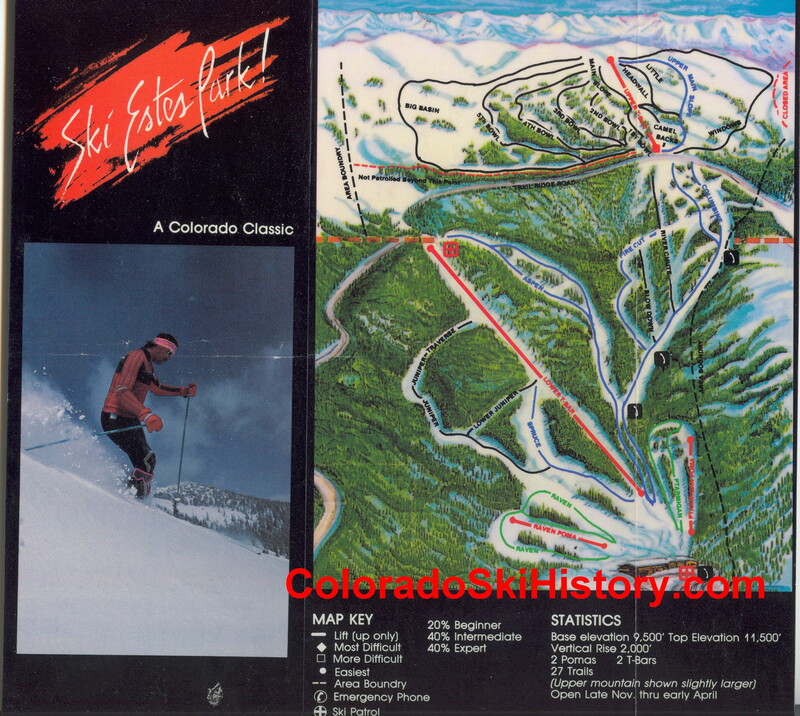 This entry was posted in exploration, family, skiing, winter and tagged aspen, backcountry skiing, columbine, eldora ski area, ghost powder, hidden valley ski area, rocky mountain national park, spruce, trail ridge road. Bookmark the permalink.